Our first meeting place was the garage/boiler room complex at the Hospital. We then used a consulting/examination room before moving to the basement. As the NHS needed more space, we decided to find premises of our own. In 1950, we bought an ex army Nissen Hut for £200 and had to borrow another £100 to transport and erect it in East Common Lane. We rehearsed at the Hut for 13 years. The first winter we rehearsed in coats and gloves before we managed to purchase a coke stove. Gradually the building became ramshackle, and in 1963 we accepted the Council’s offer to rent us rehearsal rooms in the old Library on High Street East, alongside Little Theatre Club. Here there was room to rehearse and build and store scenery. As the 1970s progressed these premises deteriorated, and in 1982 we moved to the new Activity Centre on John Street, this time alongside Group 62. We left here when the area was due to be redeveloped and, after a period of uncertainty, moved to the Grange Farm Hobbies Centre in 2000. 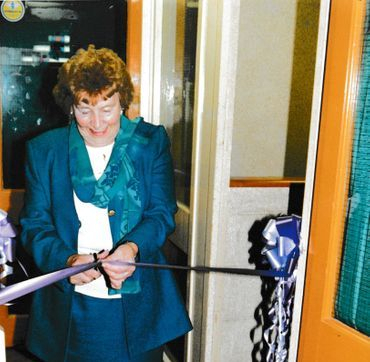 2000: Joan Brown (president of The Hospital Players from 1998-2015) cuts the ribbon on our new rehearsal room.